Ready, Steady, Go! is the fourth level of World 5 found in Yoshi's New Island. 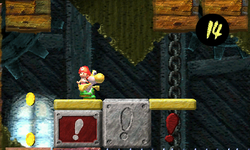 Yellow Yoshi starts the level in a castle with some platforms that get longer when ground pounded and a pipe which leads to an area with more enemies and the aforementioned platforms. Eventually, the player reaches a door which leads them to an area with falling wooden platforms and a door. The door leads to a Checkpoint Ring and some more enemies and obstacles which lead to the boss door with Kamek inside. As Yoshi is fighting Kamek, several arrows surround Yoshi and Kamek. The arrows redirect any fired projectile into the direction that the arrow is pointing. To hit Kamek, Yoshi must throw an egg at the arrows so that the arrows redirect the egg right at Kamek. When the player hits Kamek three times, the level is cleared. This page was last edited on April 15, 2019, at 12:11.